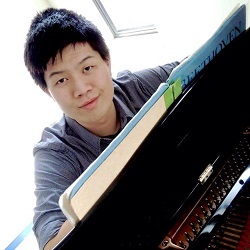 In his final year of study at the Birmingham Conservatoire during 2016, Ken Min Chyh Lim was 2nd prize winner of the Birmingham Philharmonic Orchestra Concerto Prize in 2015 and 1st prize winner of the Delia Hall Accompaniment Prize in 2016. He took up piano lessons at the age of 6 and obtained the LTCL performance diploma in 2010. Ken studies with Anthony Hewitt at the Conservatoire, in addition to masterclasses with Katherine Stott, Orit Wolf, Andrew West and Jerome Reed. His previous teachers include Chin Ying Soong, Ng Chong Lim and Samuel Tan. In 2012, Ken received the Patron’s Award for Piano Solo above 18 in the Malaysian Youth Orchestral Foundation’s music festival. In the same year, he joined the ASEAN Contemporary Music Ensemble conducted by Peter Veale to collaborate with musicians from Germany, Singapore and Thailand as they premiered new music composed by young composers. He also studied composition with Yii Kah Hoe and one of his pieces was a part of the Malaysian SoundBridge festival in 2013. Ken played Mozart’s Piano Concerto No. 17 in G Major, K.453 with the Sinfonia in May 2016.